For Blu-ray, the Future is Now. The health of the Blu-ray market seems to be an enigma to most people these days as thereâ€™s a lot of discussion, anticipation, and inquiries about the topic. However, are there adequate sales to back it up. I think the biggest misconception right now is that the Blu-ray market is slow and not progressing as anticipated compared to DVDâ€™s inception. Recent research refutes that misconception and in reality, Blu-ray appears to be ahead of DVD in terms of adoption when compared at similar times in their release. In fact, research from Futuresource is said to show that Blu-ray Disc hardware is outselling early DVD hardware and will continue to do so into the next decade. Jim Bottoms, MD corporate development, Futuresource, says: “Focusing on like-for-like coverage of Western Europe and comparing the first few years of uptake, the early indications are that BD player sales are running way ahead of DVD after the same time period”. In a survey conducted by Sony Computer Entertainment America, results for the first half of May 2008 indicate that 52% of almost 3,000 PlayStation 3 (PS3) owners plan to purchase six or more BD titles in the next 12 months. Approximately 50% prefer to exclusively purchase or rent movies in BD format, even if they have to wait longer for the title release, and over 40% report increased movie viewing since the purchase of a PS3. Statistics from the Redhill Group compiled on behalf of Home Media Magazine indicate that, as of May 18, 2008, Blu-ray software sales in the US exceeded the 11 million mark. In the first quarter of 2007, Blu-ray sales for day-and-date titles represented 1.7% of total sales for the top 10 selling titles, in comparison to the DVD version of the same title. In the first quarter of 2008, that percentage rose to 14.3%. The Entertainment Merchants Association predicts in their 2008 Annual Report on the Home Entertainment Industry that Blu-ray sales will surpass standard DVD in 2012 and be about $9.5 billion. The report found that sales of nearly 9 million high-definition discs in 2007 generated more than $260 million in consumer spending. The EMA believes in 2012, Blu-ray Disc sales will be around $9.5 billion. Based on these statistics, itâ€™s clear that not only is Blu-ray a relevant and growing format, but looks destined to gain even more of a significant foothold in the digital optical media market. Thereâ€™s no question that the PS3 has had a major impact in the growth of the format, but the important factor is not based on the method of use but rather through the sheer adoption of the format, regardless of the player. The Svalbard Global Seed Vault, which was established in the permafrost in the mountains of Svalbard, Norway, is designed to store duplicates of seeds from more than 1,400 gene banks spread over the entire planet. This vital measure is to safeguard the worldâ€™s agriculture against any negative consequences of war, pollution, climate change, natural disasters, or simply a lack of resources. The temperature inside the Seed Vault is kept around minus 18 Celsius. The roof and parts of the frontage of the visible entrance section are filled with triangles of refractive elements like dichroic mirror glass, prisms and acid resistant steel of various sizes. These shapes and elements are intended to cast the light & surrounding environment back in all directions. These lights represent a volume complementary to the dark which has been hollowed out of the permafrost within and will signal the seed vaultâ€™s position at all times. Much as the seed vault is intended to secure our food supply, itâ€™s important to have a method of preserving our history and documentation for future generations to study and learn from. Whether itâ€™s a global effort or a family interested in protecting the video of their childâ€™s first birthday, Blu-ray discs can keep your data stored and protected for years. SONY Blu-rayâ€™s stable and reliable writing mode allows all sorts of written data to be able to withstand any kind of environmental temperatures with the ability to last as long as 30 years. Blu-ray was developed to enable recording, rewriting and playback of high-definition video (HD), as well as storing large amounts of data. It offers more than five times the storage capacity of traditional DVDs and can hold up to 25GB on a single-layer disc and 50GB on a dual-layer disc. Through advancing technology it can be pushed up to 10 layers and capacity as high as 200GB. This extra capacity combined with the use of advanced video and audio codecs will offer consumers an unprecedented HD experience. If you choose to store your family photos, business data, audio and video presentations, etc. think about using the BD-RE DL storage media. This is a far more â€œGreenâ€ method of storing these items since you can compile so much more data onto a single disc. Itâ€™s good for you and good for the environment! Computex Taipei 2008, the second largest ICT exhibition in the world, ended June 7, 2008. It was the first time that Computex Taipei was expanded to 4 exhibition halls. Fortunately, we were located in the brand new Nangang Exhibition Hall, which provided twice the space of TWTC Hall 1. With the spacious exhibition floor, every vendor put extra effort in decorating their booths. With the intention to increase Vinpower Digitalâ€™s visibility on the world stage, we arranged to have two booths at Computex. To best attract customers to our booths in a growing competitive environment, we contacted professional trade show decorating companies for advice. At the trade show, we wanted to present our company image of technology, modernity, and creativity. In order to convey these attributes and decorate our booths well, the sales team had gone through with the chosen decorating company thousands of times on how to display a whole variety of Vinpower products. The intent was to show their best performance and how to better project our poster design, making our booth both vivid and alive! The most difficult times were the back and forth discussions, while decorating the booth because everyone wanted to present the company in the best manner possible. Together with every department, we finally concluded our decoration version one week before Computex reaching a consensus by majority vote. With everyoneâ€™s help and passion, we were finally ready to attend this big IT industry event. This year, we released many new products such as a line of SATA controllers, the mini autoloader- the CUBE, a new model of duplicator-Daisy Chain and LightScribe capable duplicators, and a new autoloader. Whenever people passed by our booth, our new products always attracted their attention, especially the new autoloader and the daisy chain duplicators. With non-stop camera clicks and flashes, it was easy to tell how popular our booths were. In addition the new Vinpower Daisy Chain Towers picture has been uploaded to Computexâ€™s official website for news releases. Computex Taipei is not only a trade exhibition, but is also one of the most important information and technology exchange platforms of the global ICT industry. We would like to thank all of our customers who visited our booths. Due to your support, we have faith to make it even better. We look forward to seeing all of you next year. In the time that Iâ€™ve worked at Vinpower Digital, Iâ€™ve learn a lot about the optical disc duplication market, met a lot of business contacts and friends, traveled to a number of new destinations (foreign and domestic), and moved quite a few duplication products. Now I am proud to have a new title and job function, FATHER. My wife gave birth to a beautiful healthy boy on May 31, 2008 and there has been no greater joy in my life. For that Iâ€™m happy to introduce young Asa to my friends and fellow blog readers. Sometimes, we are too busy to remember some of important holiday for our country, and how they originated. 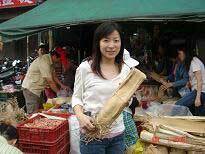 In Taiwan, the 3 major holidays are Chinese New Year, Dragon Boat Festival and the Mid-Autumn Festival. 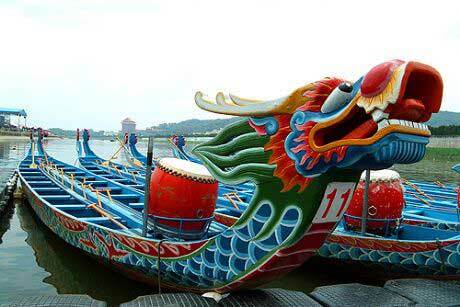 The Dragon Boat Festival will be coming soon. It is celebrated on the fifth day of the fifth lunar month. It is actually on Sunday June 8th this year. In Chinese, the holiday is called Duan Wu Jie. There are many legends about the origin of the Festival. 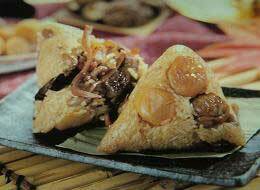 The famous one is to commemorate the patriotic poet Qu Yuan. The legend says that Qu Yuan å±ˆåŽŸ was disappointed with the emperor and his country, so he drowned himself in the Miluo River. The people loved him and tried to save him so they used long boats to go looking for him. They beat drums to scare away the fish. 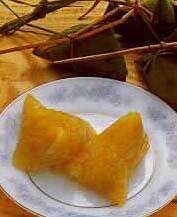 They also threw Zhong zi (rice dumplings) in to the river to feed the fish, because they were afraid the fish might eat Qu Yuanâ€™s å±ˆåŽŸ body. 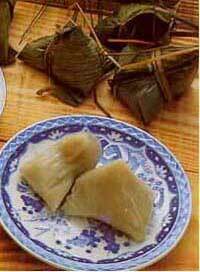 The traditional food eaten during Dragon Boat Festival is rice dumplings (Zhong zi). 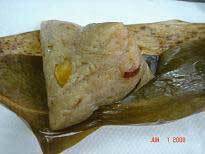 The normal dumplings are usually wrapped in bamboo leaves and filled with egg yolk, meat, peanut, chestnuts, mushrooms, etc. 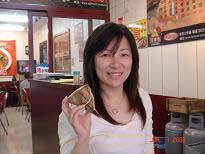 But there are many different flavors of Zhong zi that you can choose from. 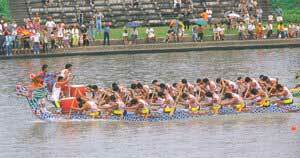 Dragon boat racing is obviously the most important activity of the Festival. The races are held in the rivers or on lakes with colorful boats, beating drums and cheering crowds get people excited. Each boat usually has 22 people, including 20 paddlers, a drummer and a flag-catcher. The first team to reach the flag wins the race. It is very interesting, and many people go to watch the race although it is very hot. I prefer to stay home and watch it on TV with my family. 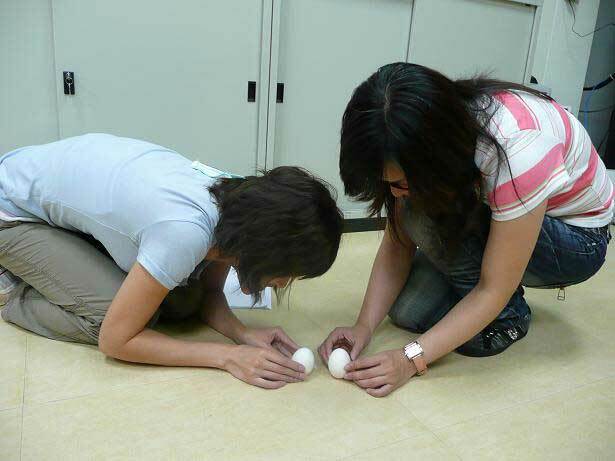 Standing an egg is also a popular activity. If you can successfully stand an egg on its end exactly 12:00 noon, then the upcoming year will be a lucky one for you. I have tried it before, but I have never succeeded. I hope I can do it then I will be the lucky one. ^__^â€¦..